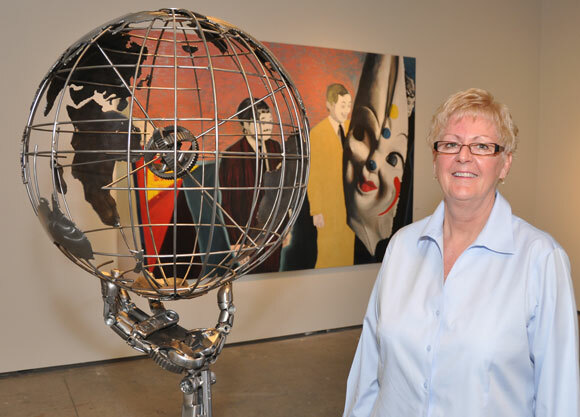 Curator Susan Belton views an untitled 2007 steel sculpture symbolizing global citizenship by Vernon artist Cory Fuhr, part of the "Male Perspective" art exhibit at UBC's Fina gallery. Outstanding and rarely viewed works from the past and present are represented in the University of British Columbia’s Okanagan campus Fina gallery’s summer exhibition, Male Perspective: Images of Men by Men. Currently on display in the FIN building gallery until Aug. 12, the art from UBC’s Public Art Collection is organized by campus Curator Susan Belton. “There are a number of works in our collection that are good pieces, but they rarely get seen because of either challenging imagery or other restrictive factors," says Belton. A similar show last year called Female Perspective: Images of Women by Women, was well received. This year's Male Perspective is a companion show, bringing together images of men by men. “This is a good opportunity to see some of the lesser-known works from the collection,” says Belton, who organized both shows. “They are strong works, and it is good to get them out of the collection room to be viewed once again. They hang well together because they resonate with an interesting reflection on the male perspective." The artists are past students and graduates from the visual arts program, and the works range from almost three decades old to just last year. “Viewers are cautioned that there is imagery in the show that might be disturbing to some, but there is a level of quality to these works,” says Belton. “Difficult subject matter sometimes makes them all the more arresting.” The show can be viewed in the Fina gallery in the FIN building, Monday to Friday, 9 a.m. to 3:30 p.m. The greatest proportion of art in UBC's Okanagan Public Art Collection has been acquired from graduating Fine Arts students. However, the Public Art Collection also features works from Governor General Award Winners Carl Beam and Nobuo Kubota, as well as works from professional artists Ann Kipling, Anna Coughlin and a number of Inuit artists, including Order of Canada recipient Helen Kalvak.